The Garrett County Sheriff 's Office is a full service law enforcement agency; a service provider and a custodian of offenders. In this regard, it exists to serve all the people within Garrett County with integrity, respect, fairness, and compassion. The Sheriff's Office is committed to the prevention of crime; the protection of life and property; the preservation of peace and order; the enforcement of laws and ordinances the safeguarding of constitutional rights and the security of prisoners. The foundation is community service, with goals to enhance the quality of life, investigating problems as well as incidents, seeking solutions and fostering a sense of security in communities and individuals. The men and women of this office nurture public trust by holding themselves to the highest standards of performance and ethics. To fulfill this mission, the Garrett County Sheriff's Office is dedicated to providing a quality work environment and the advancement of its officers through training, experience, education, and leadership. 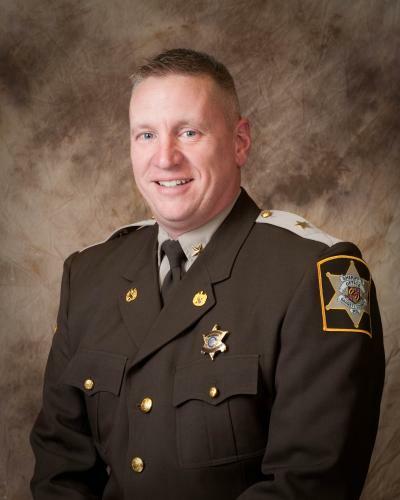 Sheriff Rob Corley is a native of Fairmont WV and a 1985 graduate of Fairmont Senior High School. He holds a Bachelor of Science degree from Fairmont State College and was hired as a Patrol Deputy with the Garrett County Sheriff’s Office in 1995. Through his tenure he was promoted to Corporal, Sergeant, and Lieutenant prior to being elected Sheriff in 2010. During his career Sheriff Corley has served as a D.A.R.E / WINNERS drug education instructor, accident reconstructionist, polygraph examiner and hostage negotiator. He currently chairs drug and alcohol committees at the Garrett County Health Department, including the Garrett County Drug and Alcohol Advisory Council. Sheriff Corley is a graduate of the Federal Bureau of Investigation Law Enforcement Executive Development School. In 1999 he received a Governors Certificate of Valor. In 2003 he was elected Police Officer of the Year through the Maryland ELKS organization. In 2004 He received the Governors Certificate of Merit in Crime Prevention through his efforts in developing and presenting community awareness programs. In 2005 he received the Maryland Governors Volunteer Service Award for those same efforts. In 2007 he received a commendation medal from the National Society of the Sons of the American Revolution in recognition of outstanding achievement and dedication to the maintenance of law and order. In September of 2009 he received the prestigious Maryland Sheriff’s Association Law Enforcement Officers Valor Award.